While almost every audio equipments pay whatever it cost to minimize distortion, this kind of device does the opposite: distortion effect for electric guitar. 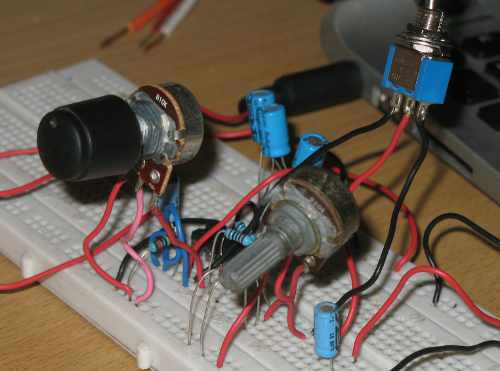 Many methods have been implemented in producing a distorted signal from electric guitar pick-up, such as over-driven vacuum tube, solid-state (transistor), or diode clipper. The simplest form is passive diode clipper, which is implemented as the core of the distorting mechanism in the presented circuit. Figure 1 shows the assembled circuit (on the breadboard), and Figure 2 shows the schematic diagram. The circuit consist of internal ground reference stabilizer U1C, signal buffer U1A, and distorter amplifier U1B. The internal ground concept is used here to give separated internal ground reference, different from external ground reference. As you can see in the schematic diagram, there are two types of gerund symbol, first is the internal ground symbol with horizontal strips (connected to the output of U1A), and the second is the external ground symbol with diagonal strips (connected to power supply, input, and output grounds). By using a stable internal ground reference (at half of supply voltage), all internal circuitry can be DC-coupled directly to minimize the components count. The clipping characteristic is symmetric, means that the amplitude level of the clipping points are in same magnitude for both for positive and negative cycles. Potentiometer VR1 is used to set the distortion level. If the peak of the signal doesn’t reach the diode’s forward bias level then the signal won’t be clipped, so the distortion level is zero. If the signal level is increased by adjusting VR1, the peaks of the signal will reach the clipping level and the distortion effect will be produced. The VR2 potentiometer is provided to adjust the distorted signal level, so the distorted sound level would be equal to the clean sound level, when S1 is switched between bypass and distortion position. The video below shows 3 round of processing the recorded guitar play, first the clean signal (without distortion), second round with about 80% distortion level, and the third uses 100% distortion level.